You will be notified of acceptance into the show by Tuesday, May 23, 2019. 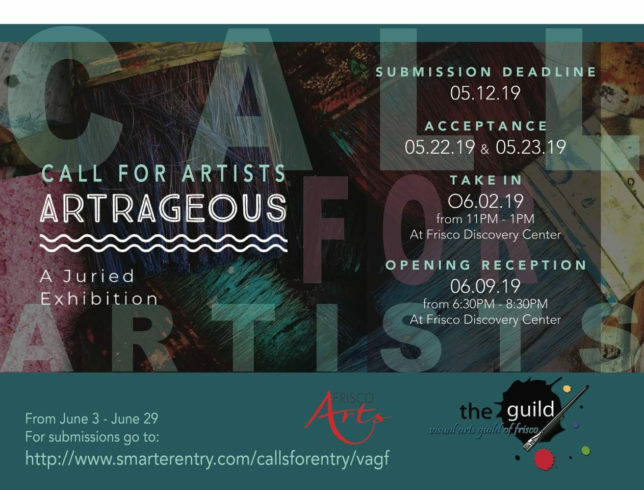 Accepted works must be delivered at the Frisco Discovery Center, 8004 N Dallas Parkway, Frisco TX 75034 on Sunday, June 2, 2019, between 11am – 1pm. Winners of the different categories will be specially called out from the invited Juror of the Show and awards will be presented at the Opening Reception on June 9th. $25.00 submission fee for members only up to 5 images. Members will receive a discount code in an email. $35.00 submission fee for non – members up to 5 images.